Stern Taxi Fare is a utility plugin conceived for taxi, ambulance or Limo companies aiming to facilitate their clients‘ booking process. The plugin provides precise estimates of upcoming or potential rides with a vast choice of options and ensures an easy and optimized booking process, while creating a client database. Customers can pay online thanks to the Woocommerce plugin. It is compatible with all woocommerce options. Hence your customers can pay via VISA, Paypal, paycheck, cash and VAT can also be included. Stern Taxi Fare is composed of a team of fully trained developers with several years of expertise in auto dispatching taxi, limo, ambulance system development with mobile and web interface. The purpose of this plugin is to assist companies related to taxi, limo, ambulance business to allow their customers to calculate the ride fare. Use shortcode to display and use the plugin wherever you want in the WordPress environment for WordPress. Stern taxi fare plugin for WordPress is very simple and powerful plugin. Please find documentation of this plugin here. 2. How it works ? Price = cartype_Fare + (distance x distance_fare ) + (duration x duration_fare) + (nb_seats x seat_fare) + (nb_Toll x toll_fare) With a minimum of minimum_price. Thanks to ‚pricing rules‘ feature, it is possible overwrite formula with a fixed price for specific ride. e.g All rides from everywhere in city to a specific airport with a specific car. Your language is not here ? Contact me and let’s localize it together ! First step is to make sure you have the best theme for this plugin. Glyphicons. (included in bootstrap) (http://getbootstrap.com/components/), and not fortawesome (https://fortawesome.github.io/Font-Awesome). The page where this plugin will be called should not have API google used as this plugin is using this API.
! The design of the plugin inherit from your theme. So if the design is broken, it is because of your theme. Try to change your theme if you have any issues! Transport – WP Transportation & Logistic Theme. You also have recommandation. Please add a comment and let us know! Your customer can have can invoice of the trip in PDF. Install this great plugin WooCommerce PDF Invoices. Follow instruction given in plugin to add your custom template. Go to Woocommerce => Invoices => Template. Select sternTaxiFarePDF. Order must be complete to have invoice generated. Please find a example of an invoice. Automatically generate and attach customizable PDF Invoices to WooCommerce emails and connect with Dropbox, Google Drive, OneDrive or Egnyte. Q: When I click on „book now“, nothing gets added to the cart. It takes me to a cart page that says its empty. Q: Where can I add a ‚Terms and Conditions‘ checkbox? A: this option is available in WooCommerce ! WooCommerce -> Settings -> Checkout -> Checkout Options -> Terms and Conditions. Q: WooCommerce did not install pages propely. What should I do? Q: The product is not correctly created, even after clicking on the ‚create button‘ ? Q: I have this error message : „Option allow_url_fopen is not allowed on your host“? Note that this setting will only apply to PHP file’s in the same directory as the htaccess file. More information here. Q: Since I have installed this plugin, I have design bugs with my themes. A: It is because there is a bootstrap conflict with your theme. See recommandation here. As a quick fix, try to play with options „Use library bootstrap js“ or „Use library bootstrap css“ in design tab. If it is still not working, try with another theme. We recommend to use our theme : Stern transportation. A: We are still waiting for this feature!! As a quick fix, you can show addresses in a dropdown. Calculation will work and google autocomplete will be deactivated. When I click on „Book“ I have an error message : Not Found The requested URL /false was not found on this server. This function allows you to get price. Returns a string containing the JSON representation of value. This function allows to login to WordPress. This function get version for plugin. You can change all texts of this plugin for every languages. Download this free software: Poedit Gettext Translations Editor. Thanks to your FTP, save folder wp-content/plugins/stern_taxi_fare/languages to your local drive. Change text you want in Poedit. Overwrite this file on you server thanks to ftp. This feature gives the opportunity to your customer to help them to set correct address. In order to check this error, open your console in your browser and check for error (in red). This issue comes from the fact your theme or another plugin is already using Google Maps API. Try to deactivate all other plugin except WooCommerce and Stern taxi fare. Try to use another theme. If you have web hosting already and would like to install WooCommerce using the WordPress Admin to install the plugin is the most straightforward option, as it handles the file transfer without you needing to leave the Web browser. Type ‘WooCommerce’ into the Search Plugins field and hit Enter. Once found, you can view details such as the the point release, rating and description. Click Install Now. After clicking the link, you’ll be asked if you’re sure you want to install the plugin. Click Yes, and WordPress completes the installation. Bluehost: A scalable platform, pre-installed with WordPress, WooCommerce, and our Storefront theme. This hosting package includes a dedicated IP and SSL certificate to keep your store protected and secure. Read more here. SiteGround: Get your shop pre-installed with WordPress, WooCommerce and Storefront – along with premium plugins (Akismet and VaultPress) for spam protection and site backups, an SSL Certificate & dedicated IP for extra secure payments. Read more here. It’s possible at this stage that you’ll be taken to a page requesting FTP details of your webserver. This happens if you’ve not installed a plugin on this particular installation of WordPress. If that’s the case, fill in your details to complete installation. 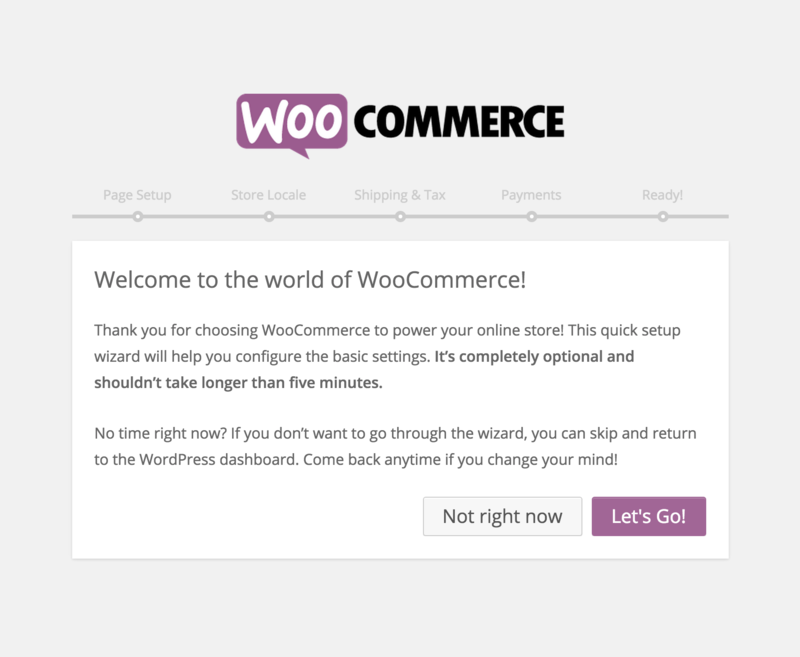 Now that you’ve activated WooCommerce the WooCommerce Onboarding Wizard can help you setup your shop. Select ‘Let’s Go!’ to get started. If you’d prefer to manually setup your WooCommerce shop select Not Right Now. If you chose to setup your shop manually select Install WooCommerce Pages to get started. If you are using a third-party theme (a theme not made from WooThemes) and the WooCommerce pages aren’t displaying correctly, ensure your theme declares WooCommerce support. If you aren’t sure, contact the theme developer to ask them if it is a possibility. If you have a theme you want to use with WooCommerce that does not yet have WooCommerce Support, please reference our developer documentation to learn more: Third-Party Custom Theme Compatibility. You language is not available yet, You can create your language translation. File => new from POT => open file stern_taxi_fare-en_US.pot and chose your translation language. A file name *.mo is also created. Upload both file (*.po & *.mo) to your server in languages folder. You want to share you translation? Don’t hesitate to send these files to us. We will integrate them directly to plugin! Click to “Install Now” when you find the plugin. Activate the plugin by clicking “Activate”. Check if Woocommerce is installed before activating this plugin. If not, install Woocommerce plugin! Copy the plugin in plugin folder and then activate it from the admin side. Use WooCommerce to configure financial data like VAT, currency, type of payment. To make sure this plugin is working properly, WooCommerce pages must be installed. To do that, launch wizard given by woocommerce or install WooCommerce Pages manually. Tookan is a great tool to manage your task online. Tookan Brings All The Essentials In One Place That Helps You Spend Less Time In Organizing Your Business And More Time Delighting Your Customers And Growing Your Business. Some businesses will prefer having customers pay a deposit in order to make an online reservation. This is beneficial for your transportation business because it increases the likelihood that your customer will not cancel their reservation without informing you. Adding a deposit functionality to Stern Taxi Fare is very simple using the following steps. *Before you start, be sure you have already uploaded and activated WooCommerce and the Stern Taxi Fare plugins. Install the plugin and activate it. In your WordPress dashboard, navigate to “WooCommerce” → “Settings”. You will now see a tab that says “Deposits” where you can set parameters. In the WordPress Dashboard, navigate to “Products” and edit the “Taxi Fare” product that was automatically created when you installed the Stern Taxi Fare plugin. Scroll down to the bottom of the page where it says “Product Data.” Within this box, click on the bottom tab that is labeled “Deposit.” From here, you can set additional parameters to enable or force a deposit, and specify the type of deposit. In the screenshot below, I have set up a forced 15% deposit for every Stern Taxi Fare plugin transaction. Within the same “Product Data” section, click on the “General” tab and input a number into the “Regular Price” section. This can be any random number, and it will not impact your transactions going forward, but you MUST have a number here that is not zero in order for the deposit plugin to work properly. Now, update and save the product. Now when you complete a transaction, you should see the deposit take place in the “Review & Payment” stage. Google API give the opportunity to plugin to display map and calculate distance, time and price depending on pick up address and destination address your customer will use. (a) When you create a new key, it must be a ‚browser key‘. Create your own API key. It allows you to monitor your application’s Maps API usage. Google actually blogged about this change not long ago. * We no longer support keyless access (any request that doesn’t include an API key). Future product updates are only available for requests made with an API key. API keys allow us to contact developers when required and help us identify misbehaving implementations. Ok great, so you just have to get the key it seems! I noticed that requests for old URLs that have already accessedMaps API data worked, but any new URLs failed. In addition it looks like localhost access to the API doesn’t work very well now, even when using a key. So what you need to create is a browser key. Google has a page describing how to get the API key. If you click the‚Get a Key‘ button it will take you through the right steps. First you will be asked to select a project or create a new one. Then you’re taken to the Credentials page where you can generate the key. It’s a good idea to give this key a meaningful name as well as add a domain to restrict it to. If the key is unrestricted, other domains can make use of your key, which will reduce your quota allowances i.e. bad things will happen. After you click ‚Create‘, your new API Key is presented to you. 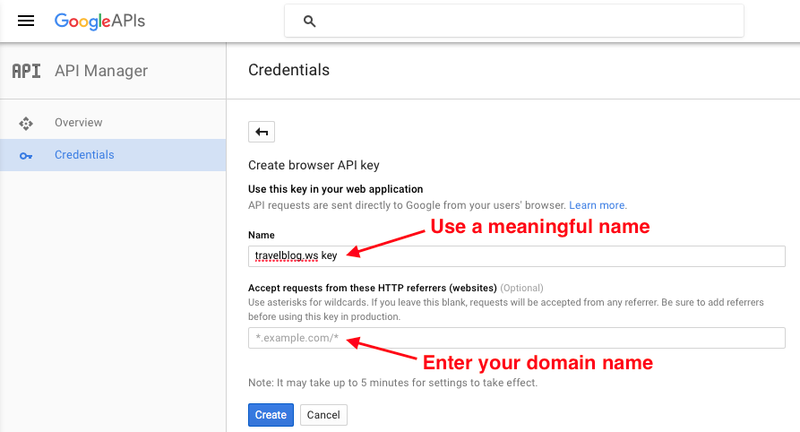 Follow these steps to create and implement a free Google Maps API Key. Start Google’s Get a Key process then log into your Google account (or create one). Click Agree and continue to create a new project representing your website. Under Accept requests, add the two entries below (replacing yourname.comwith your own domain). Type the first entry then hit enter on your keyboard to add it. Repeat to add the second entry. Having both entries (with asterisks) will help ensure your maps work on any URL of your website. Click Create then copy your key that is now shown on the screen. If you’re using our WordPress plugin, go to Settings > Church Theme Contentand paste your key into the Google Maps API Key field then click Save Changes. Otherwise, do similar according to the product you’re using. Note: Google says it can take up to 5 minutes for your key to become active. We’ve heard reports of it taking 30 minutes or longer. Keep this in mind if your maps do not show right away. Your domain must be verified. Follow the steps given by google. Use shortocode wherever you want in your wordpress environnement. After installation please add shortcode on your website page to display the fare calculator. This shortcode can be used in a page or a post. This plugin can also be used as a widget. This plugin „WC Cancel Order“ compatible with stern taxi fare will let you the possibility to let your customers cancel their order if they want. f. Where Is My Purchase Code? 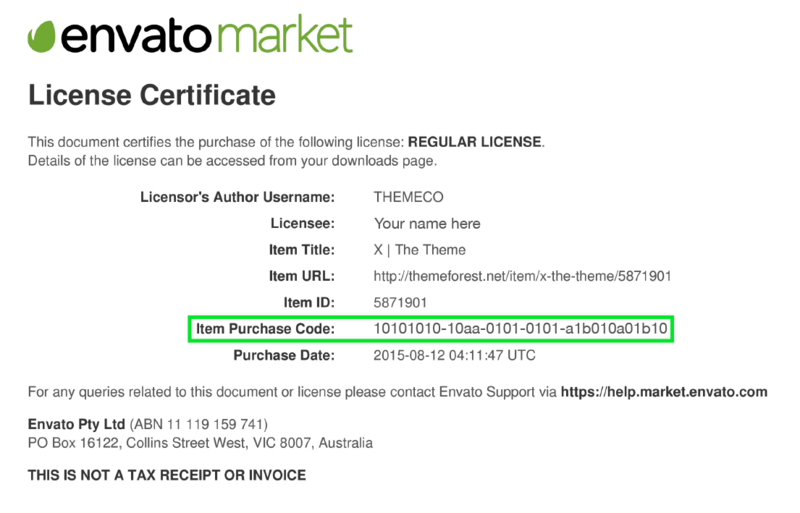 Log into your Envato Market account. Hover the mouse over your username at the top of the screen. Click ‘License certificate & purchase code’ (available as PDF or text file). Below is an example of a PDF License certificate and purchase code. All colors of this plugins inherits from your theme. Sometimes it turns out some color should not be white. Hence Calendar is not visible. You can change these colors by overwriting your css theme. Use a Plugin like Simple Custom CSS. Your data will not be erased. Chrome has public intent to deprecate powerful features like geolocation on non-secure origins, and we hope that others will follow. Starting with Chrome 50, Chrome no longer supports obtaining the user’s location using the HTML5 Geolocation API from pages delivered by non-secure connections. This means that the page that’s making the Geolocation API call must be served from a secure context such as HTTPS. It is an important issue as it will directly impact any site that requires use of the geolocation API and is not served over https, but it is a change that we do believe is beneficial to all users on the web. This post should help you understand the reasoning and how to proceed. This change is effective as of Chrome version 50 (12PM PST April 20 2016). Location is sensitive data! Requiring HTTPS is required to protect the privacy of your users’ location data. If the user’s location is available from a non-secure context, attackers on the network will be able to know where that user is. This seriously compromises user privacy. A type car is a vehicule. You can add, edit or remove. A type car must be linked with a category. By default, price doesn’t include VAT. To enable it, and to get this result, please follow those steps. Extra information in form can be added in checkout page. This plugin Woocommerce Easy Checkout Field Editor gives you capabilities to manage your fields on your WooCommerce checkout page. Woocommerce Easy Checkout Field Editor Plugin Lets you Add /Edit / Delete fields in checkout form . You can reorder them using our Drag and Drop Admin UI .Plugin Supports 8 types of widely used custom fields. You can opt to send custom field data with order email and also display it on admin order page. This option shows a QR code. The link is the ADMIN order of WooCommerce. Driver will be able to scan QR code and automatically redirected to the order management. Options for calendar will generate a process for the form. This feature allow you to replace google drop down auto-complete to a list of address you have chosen. It can be used for a list of airports for example. Pricing rules is a great tool to override formula. Plugin will work like this: First, it will check for each pricing rule if pick up and destination address match with the ones given by customer. If no rules are satisfied, then, it will use the classical formula set up in tab ‚type car‘. Warning: Each rules will use google API to check if city or address match with address given by vendor. Depend on your host but it takes an average of 30ms for each rule. So if you have 100 rules, it can take up to 30 seconds to pars all rules. We recommend to us ‚exact address‘ to avoid using google API. It will only check if address given by vendor match with the rule. A type car can be unavailable for specific amount of time, day or every week the same day. This plugin give the possibility to set a fixed price if customer book a car from anywhere in a city to anywhere in another city. Exact name enable pricing rule for an address which doesn’t exist. It will not going to calculate distance. Exact name are used for fictive names. like ‚Point A‘ to ‚Point B‘. Distance and time are are not going to be accurate. To helps customer, this address can be add in drop down ‚list address‘. This plugin give the possibility to set a fixed price if customer book a car from anywhere in a city to a specific address. This feature is usually used for airport transportation. This feature allows you to create as many rules as you want with 1 upload only. Use tab to split each colums. 1 rule per row. Open file and copy/paste rows in your wordpress backoffice. When in this pickup field a value is selected, it will refresh Destination dynamically based on rules. This option works only when dropdown are set for pickup & destination. Only field pickup is populated. Refresh button will clear destination dropdown. If value is changed (in both fields), booking button will be disabled. button „check price“ must be clicked again to refresh price. sternCab 2015 powered by WordPress.